The next time you're trying to sneak a drink into a venue that wants to charge you an arm and a leg for a beer, leave your giant bladder-filled sombrero at home. 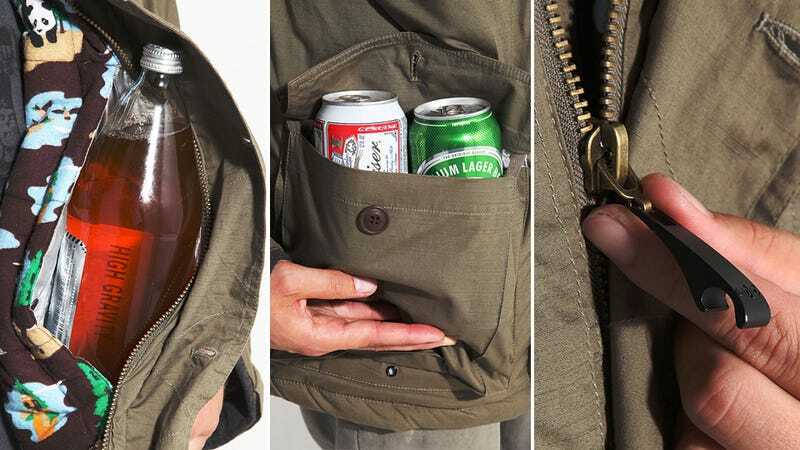 Skateboarding brand Enjoi's Beer Hunter Jacket provides a better solution: a couple of insulated cooler pockets for keeping bottles and cans chilled. But more importantly, when you're imbued with booze you won't look like a smuggler stuffed to the gills with contraband. The rest of the coat is insulated as well so it just looks puffy and warm whether or not you've got a secret payload on board. And at just $105, it will easily pay for itself after just a few outdoor football games where you don't have to buy a stadium's marked-up hooch.